1) My laptop is not yet fixed, although I do have access to a computer to do some things. 2) The talented American John T. Quinn drew a picture of me while he was visiting this nation. Once again it is completely unflattering and completely accurate. Interestingly it looks just like my grandmother. Does you Gramma need laser hair removal? The mouth in the shape of a chicken's arse is not right but it should have been like that for real...The gay expression (Boris style)is spot on. 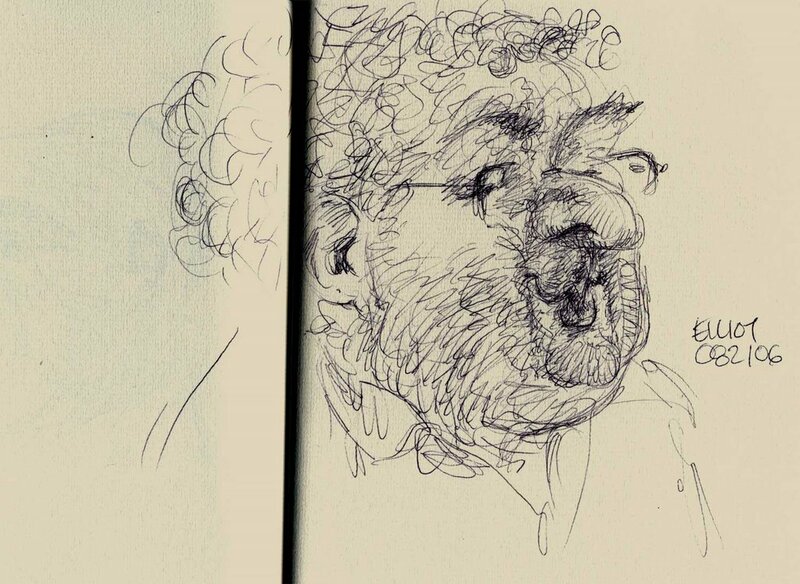 Someone commented on my blog that my drawings looked like yours. I swear that it is not my intention to imitate your art work. Sorry if this has caused you any distress. Oscar's been crying up and down like a little girl ever since he found out that you're stealing his designs! he's been calling you names for weeks, MONTHS even. I think this will have to be settled in court young lady. and Elliot too for that matter.